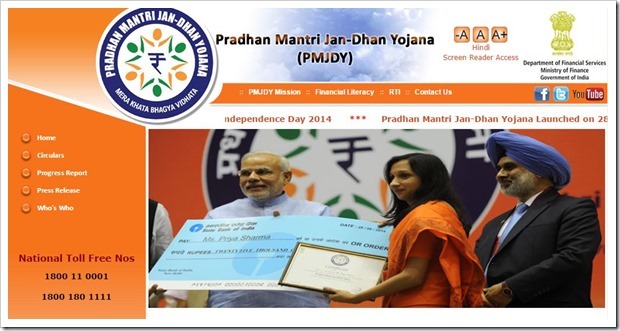 Indian PM Narendra Modi’s ambitious Jan Dhan Yojana has received tremendous response from all quarters of the society, as more 7 crore new bank accounts have been opened so far, collecting deposits of more than Rs 5000 crore within 2 months. Such is the pace at which new accounts are being opened, that Govt. has been forced to double the target. As more than half of India still doesn’t have any bank account, it is very important to promote and encourage banking so that Govt. welfare policies and schemes reach them. If an economically poor family doesn’t have any bank account, the relief packages and subsidized commodities which Govt. offers will be very difficult to reach them. Considering these factors, Modi launched this mass empowerment banking scheme: “Pradhan Mantri Jan Dhan Yojana” on August 28, 2014 to include every household in India into the banking system. Along with banking account, the person will also get other benefits such as Kisan Credit Card, Health insurance and other benefits. The bank officials had a target of enrolling 7.5 crore new bank accounts by January 26, 2015, which is now very close to being achieved just 2 months from launch. Government is now considering to double this target to 15 crore new bank accounts considering the huge popularity and attention this campaign has received. Finance Minister will review the progress so far, and will accordingly take the call on that. Almost 4 crore RuPay debit cards have also been delivered to these new bank account holders, with delivery for the rest of them currently underway. Account holders are also getting an accidental insurance of Rs 1 lakh with every account, along with an overdraft facility of Rs 5000, which can prove to be a miracle for small business men and traders, along with those in agriculture. Another very interesting phenomenon which banks have observed is that the balance accumulation has increased to Rs 750 as an average, which suggests that people are slowly warming up to the idea of depositing their money in banks. Previously, it has been observed that such no-frills accounts with zero minimum balance tend to remain dormant with no transaction or addition whatsoever. In fact, before the launch of this national wide program, most banks which offered such as no-frills bank account for economically backward families used to have an average deposits in the range of Rs 250-500. With Jan Dhan Yojana, this figure has increased to Rs 750, which is again an achievement for the bank officials and the Government. You can find more information about this scheme on their website; and here is the complete policy draft which includes their mission, vision and future plans.